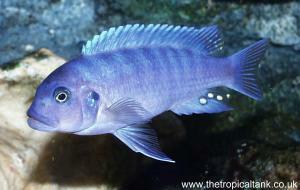 Compatibility: More peaceful than larger cichlids, but they will become territorial when spawning. 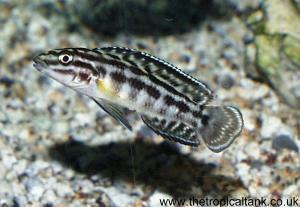 They can be kept in a general community tank setup, but allow space for territories if other dwarf cichlids are included. 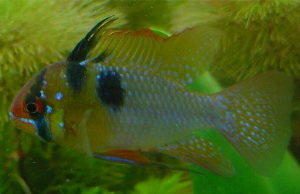 Water chemistry: Soft and acidic, pH 5.5 - 6.8 preferred, though this species is more tolerant of slightly alkaline water than many other Apistogramma. Feeding: Carnivorous: will usually take dry foods, but live or frozen foods such as bloodworm, brine shrimp and mosquito larvae will be preferred. Sexing: Males are larger and have dramatically elongated rays in the dorsal fin, giving rise to the common name. Breeding: Soft and acidic water of excellent quality required. 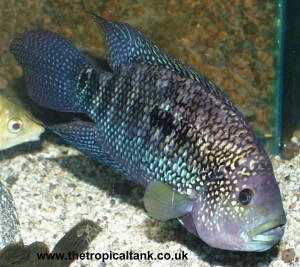 Can be bred as a pair or a harem with several females holding small territories. Provide caves with a very small entrance. The female normally guards the fry, while the male defends the wider territory. Fry are normally free-swimming in about a week. 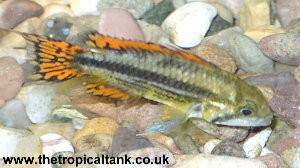 Comments: This is one of the most popular and commonly available of the Apistogramma species, and several colour forms are available, such as the popular "Super Red" and "Double Red" varieties.